Create inspirational bracelets and necklaces using our exclusive laser engraved wood discs. 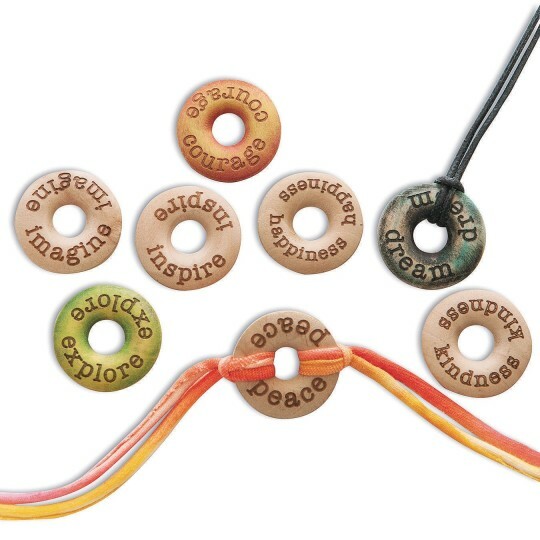 Each smooth, uncoated wood piece can be left natural or painted/dyed any color for one-of-a-kind positive message jewelry. Combine more than one! Pack of 48 includes 6 each of the following eight words: Inspire, Happiness, Courage, Peace, Kindness, Imagine, Explore & Dream. 30mm. Hole is 10mm (3/8”) in diameter.